Although I am a self-confessed control freak, I do (occasionally) like a spontaneous moment. Saturday was one of those. I had a piercing done in a tattoo studio in Notting Hill at the end of the summer (I also had a tattoo, but that’s for another day) and – I loved it! Presented with a day to myself I decided to head back in to London to add to my collection! I digress, that was not the spontaneous bit. Whilst on the train with my friend Clare, we decided to treat ourselves to afternoon tea. Now this is where I have a problem with being spontaneous, as most obvious places for afternoon tea were fully booked – funnily enough on a Saturday afternoon. So we moved our search away from the popular hotels and decided on Muriel’s Kitchen which I’d heard of through the ‘bloggersphere’. 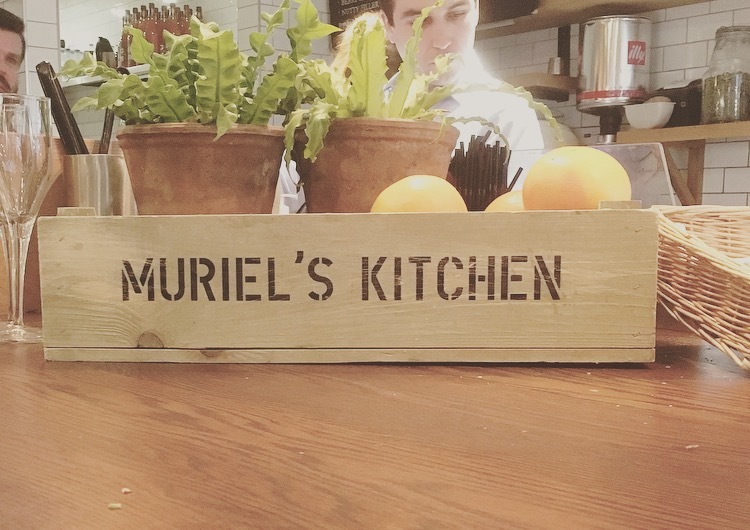 There are a few Muriel’s Kitchen’s in London, we went to the one in Soho. When we arrived we knew we’d made a popular choice – the place was packed with a queue at the door (thank goodness we’d booked online – there are some up sides to being a control freak). The place had a great vibe and we were taken to our seats quickly. The decor was quirky with some swings as seats and colander’s for light shades, very Instagram worthy! The afternoon tea is reasonably priced at £16.75 (less than half the price of most London hotels, although I appreciate a different experience) and was the perfect quantity; one scone each, four finger sandwiches and six cakes (minis) between us. Service was quick and our tea arrived on a cute wooden picnic table. We ordered English breakfast tea (I confused the waitress by asking for coffee – and actually reverted back to tea as it clearly was going to be a problem) and had a cheeky glass of prosecco too. The afternoon tea also included a smoothie, served in a milk bottle, which was a lovely idea. We had the vegetarian sandwiches; egg & cress (with a bit of coriander thrown in) and cucumber, not the most imaginative options, however they were fresh and tasty enough. The scones really let the tea down. They were very dry (so dry I nearly choked)! We both could only manage one half, which was very disappointing. The cakes looked delicious, but I have to say, were pretty bland, taste wise and we ended up leaving quite a bit. 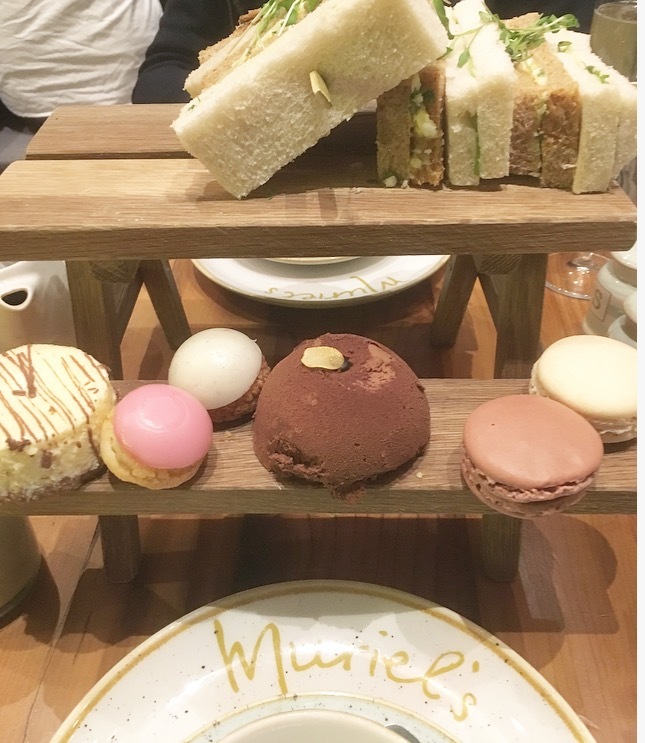 I really wanted to like this place, but feel the food let it down (which obviously is an important factor for an afternoon tea)! We left (a little peckish) and wishing we’d skipped the afternoon tea and tried something from the main menu, which looked rather good. I would like to return, just not for an afternoon tea. 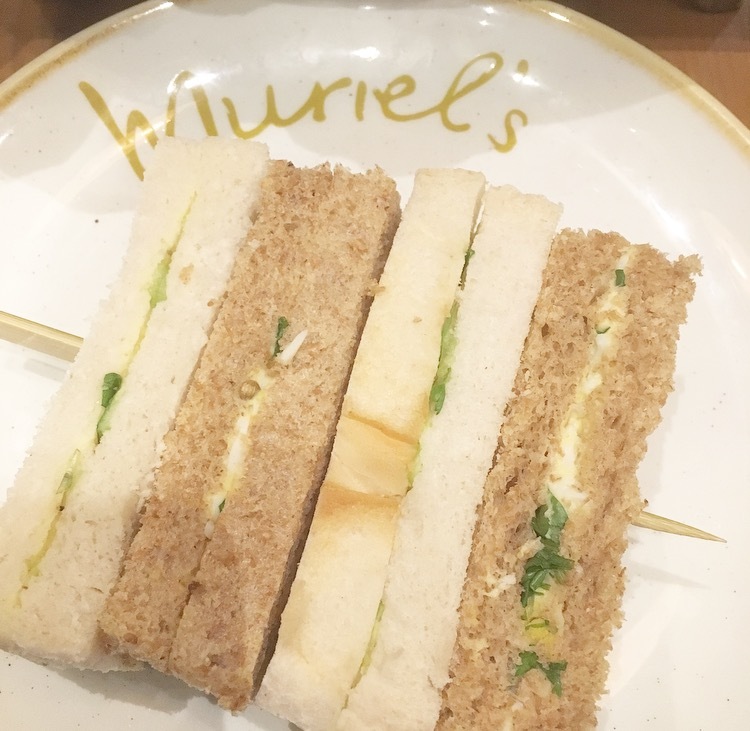 Have you been to Muriel’s Kitchen? What are your thoughts?